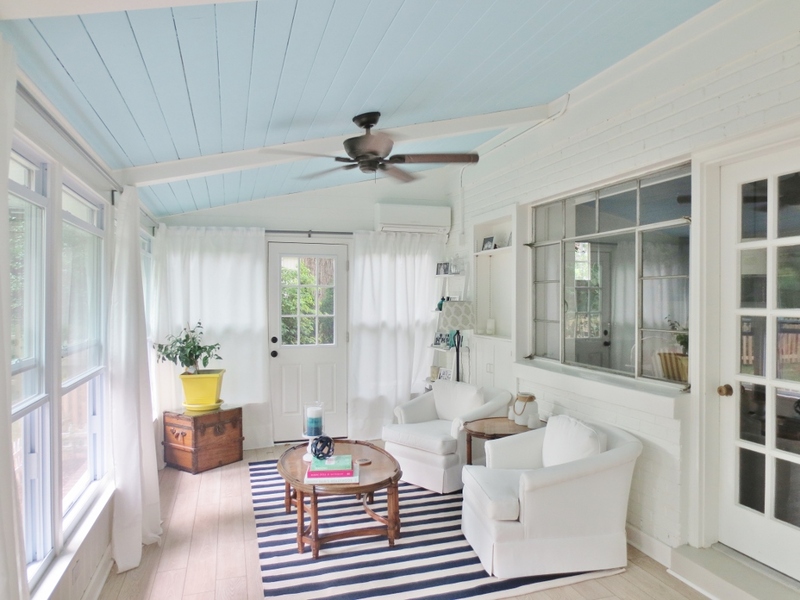 Kids, are you ready to see the finished seating side of the sun room? Are you? Well you have to wait! Just kidding, you control your own mouse, scroll down if you want. But first let me entice you with some details. 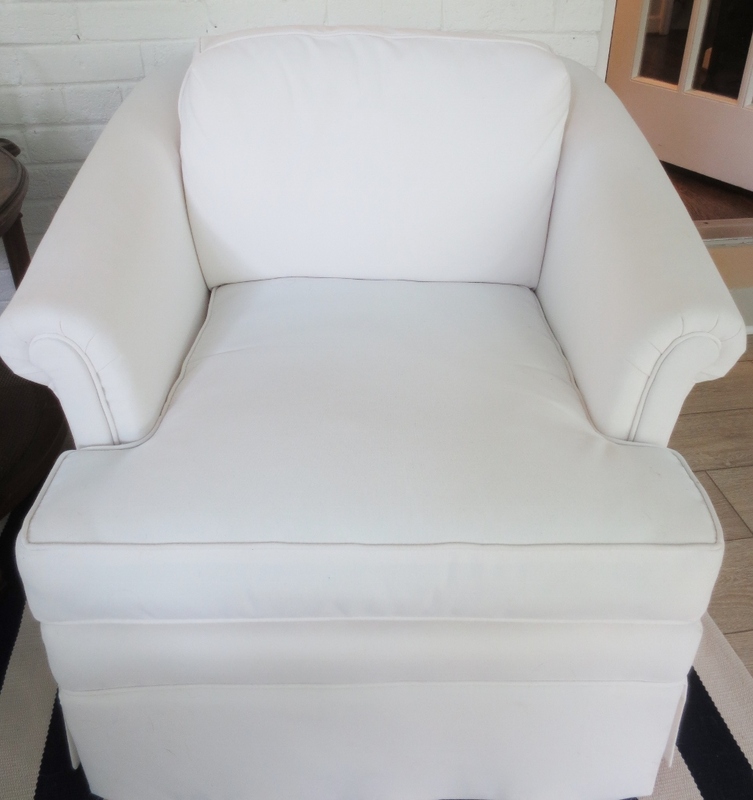 I have already discussed how we decided to re-upholster the chairs in a white Sunbrella fabric. They were delivered this past week and I am in love with them. So glad we saved and then splurged. I may have mentioned that the coffee table is my late grandmother’s. I love the marbled wood top. It has a matching side table with this super-handy pull out tray so you don’t have to use coasters. In case you are wondering about the decor items, the sphere thingy, candle and holder on the coffee table are all from Tar-jay. 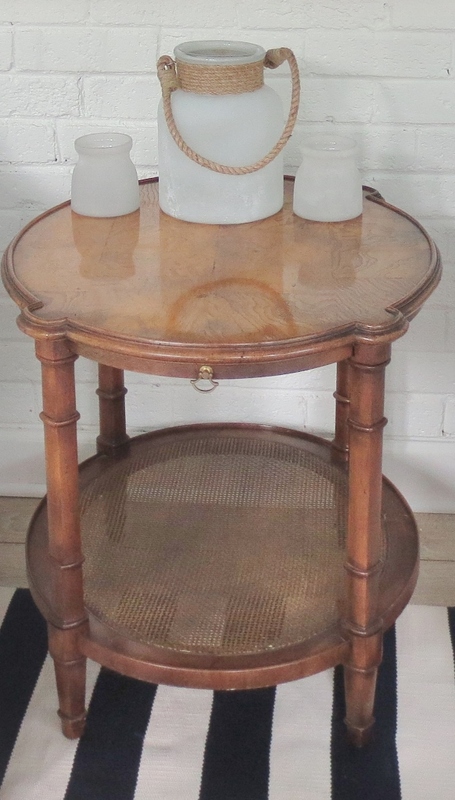 The candle holder base was originally brown/wood tone, so I spayed it white. The books were ordered off Amazon but were used and really inexpensive. I ordered colors and topics that I thought would go together and hoped that two or three would work size-wise. I think I ordered four or five books for a total of $10 and these were the ones that worked best. The adorable front crock and candle holders were a birthday gift from my sister and brother in law and I can’t believe how perfect they are for the side table. I believe she got them at a boutique where they live near the beach in North Carolina. 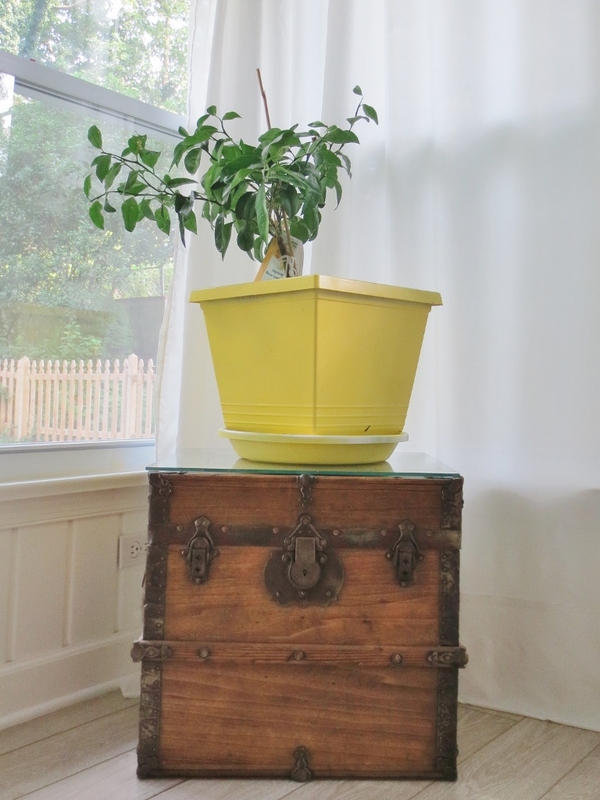 This trunk turned plant stand is also a family heirloom, from my father’s side. This trunk was originally my great, great Aunt’s or someone of that nature and the legend is that she was a Boomer Sooner in Oklahoma and this was the trunk she had with her on her wagon when she squatted on her land. The plant is a dwarf meyer lemon tree that I ordered from Four Winds Growers in California. I have no idea if I will be able to keep this thing alive long enough to produce any lemons, but I have been trying! 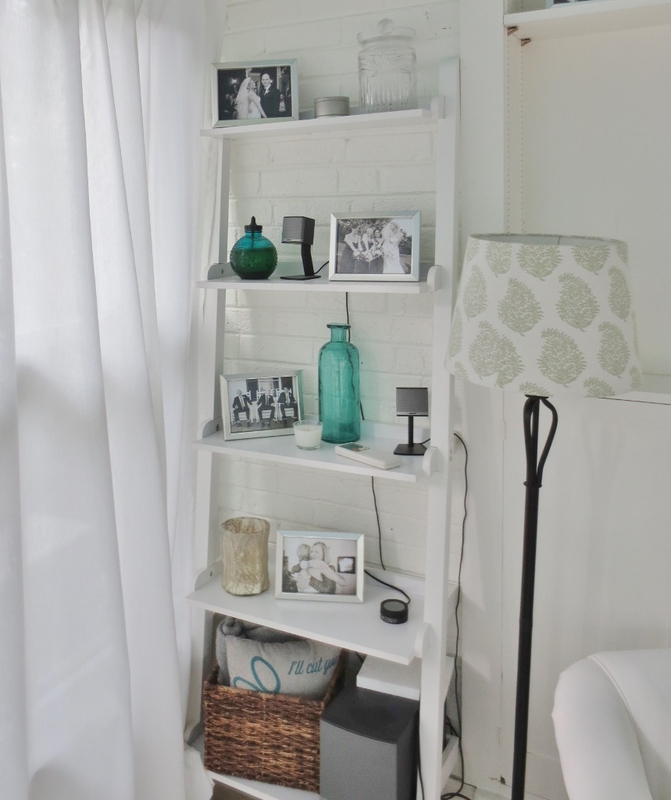 I ordered this ladder shelf from Target over a year ago thinking that it would work in the family room, but it never really felt right in there so it’s been out here ever since we painted the walls. I finally finished decorating it by adding some black and white photos from our wedding. The last piece of the piece of the puzzle over here is the rug. 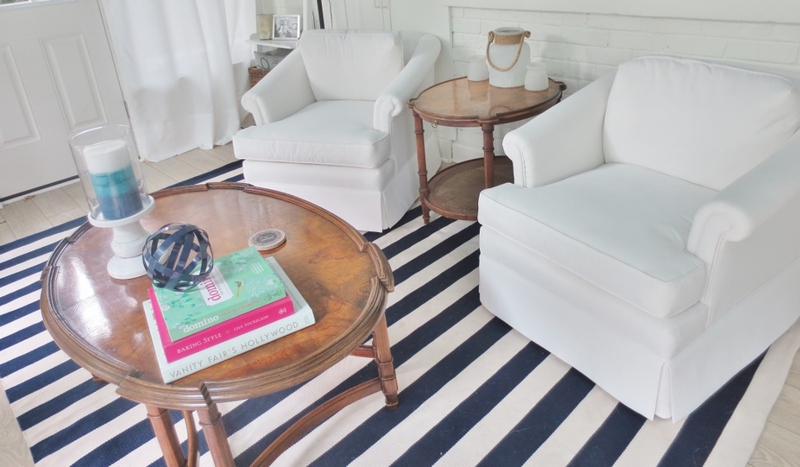 I knew from the beginning I wanted a striped rug with the stripes running the opposite way from the floor tiles because I thought it would help the room appear wider. 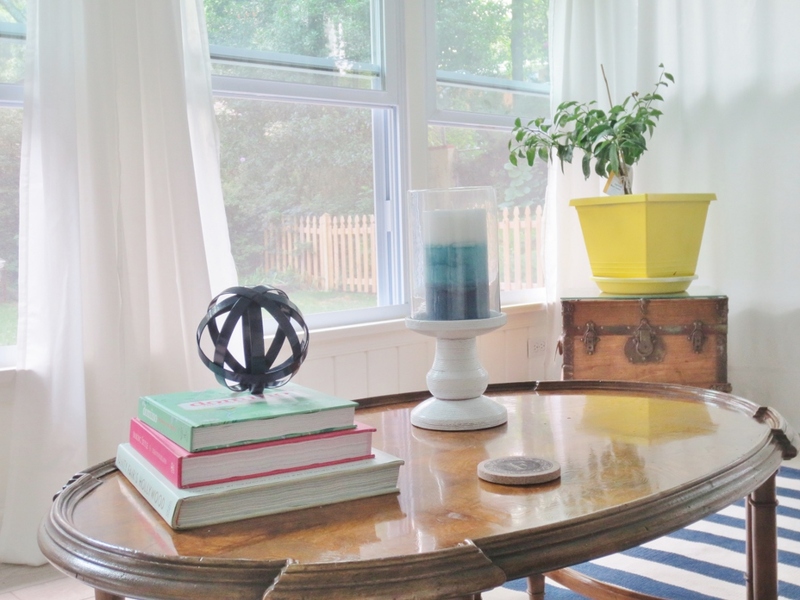 Since I already have yellow accents in the room, I thought navy would be a nice, contrasting semi-neutral that I can layer more seasonal colors on top of with pillows, etc. 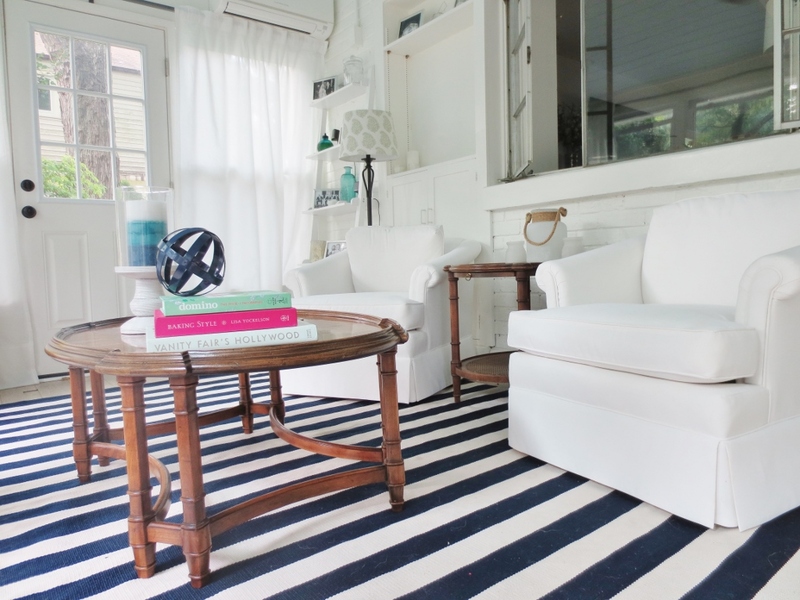 I hunted around for over 6 months until I settled on this outdoor rug from Dash and Albert. I liked it best because in addition to being low maintenance, the stripes run the right direction. So now, without further ado, here’s the finished* sun room seating area! *Okay, so it’s not quite finished. We have found that it would be nice to have some form of seating on the other side of the chairs. Something modular and small. Like these poufs also from Dash and Albert. But #1, they are out of stock, and #2 they are $231 each. Wowza! 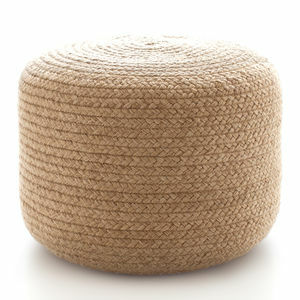 I think the natural and textured look of these coupled with the striped rug and white chairs would be amazing, but I just don’t know about spending that kind of coin on a “pouf.” Anyone know where I can get the look for less? We’re slowly working our way from one side of the room to the other, putting the finishing touches on this project. The next step is the dining table area where we need to re-cover the chairs in a more neutral fabric and add a mirror. From there we will tackle the bar area and be done sir, done! We ordered the fabric for the chairs and it arrived this week as well so maybe we’ll find time this week or weekend to get that done. We’ll see! 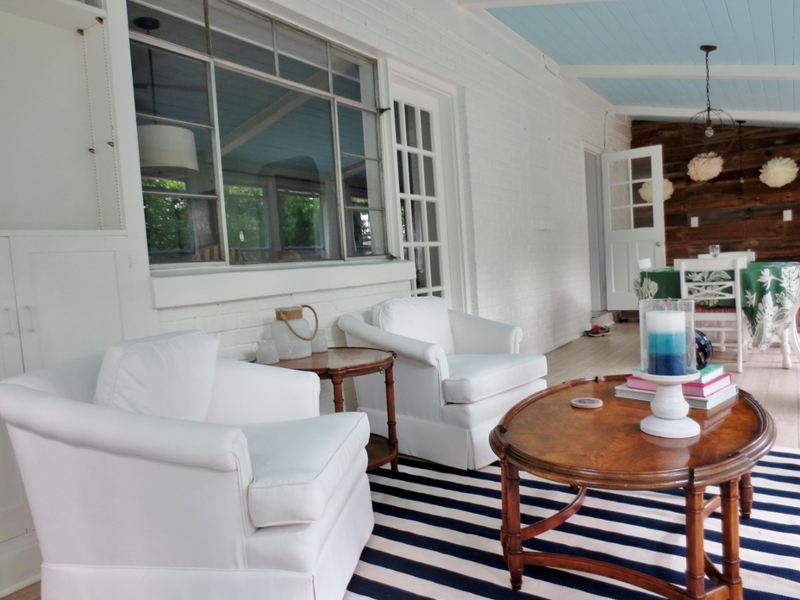 Wow, hard to believe those are the same chairs…..love the transformation. Your room is looking amazing. Well done! I just saw those poufs in an IKEA catalog for much less…! Check it out!